"lots of cocoa means lots of flavor"
I won't argue with that tagline as there is plenty of flavor here, but it maintains a respectable balance. It's not like it's some super dry, gritty, cocoa powder flavor. The typical three twins quality is still here and they've kept things in balance like they always do. I've never not enjoyed a pint of their ice cream. This is just a straightforward flavor. No mix-ins and no swirls, so you'll have to add those yourself. It's just a nice rich base. 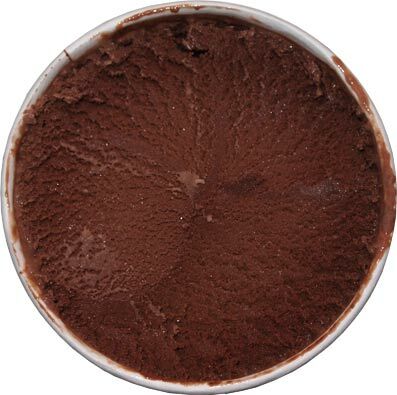 It leans towards being a dryer, deeper, darker chocolate, but it's remembering it still needs to be ice cream first. There still needs to be some sweetness and creaminess going on so that it doesn't stray too far from milk chocolate. Rambling aside, it's a fine flavor. It's exactly what I expected from them. I'm glad Market Basket is finally carrying these because I can finally add three twins in to my regular rotation and hopefully try all the flavors I've been missing over the years. It's a nice product and it's hard to beat organic at $3.99 a pint. Sure Humboldt is cheaper but three twins knows not to ruin a flavor like this with gums and stabilizers. On Second Scoop: NOM NOM NOM. I have a thing for chocolate on Saturday mornings and the texture is a bit less messed up as I go down. This one may not live to see tomorrow. I hope you'll try their Vanilla Bean and post a review. Its the best vanilla ice cream I've ever had. Accept this challenge Dubba! Their lemon cookie and their chocolate orange confetti are both delicious!!! I also just tried their brownie batter chunk. It, too, is very good. I wish I had access to more of their flavors. Love their ice cream! My favorite though by far is Dad's Cardamom. So creamy and exotic! Unfortunately, I haven't been able to track down a pint for quite some time. Always on the hunt! 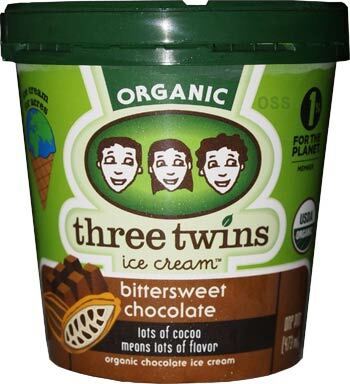 Don't you think Three Twins is a little thin and icy? Thats my only complaint with Three Twins. They actively use a less than premium base. 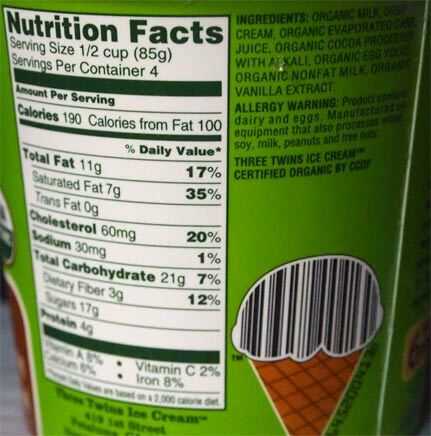 You can tell from the calories (190 vs the usual 220 or higher per half cup for the super premiums) and they use a more milky base and less cream so the fat totals are lower. I love the fact that theyre organic, but I cant help but not love this brand for those reasons. Three Twins and Straus both use Straus organic mill from California but I figured out that Straus makes super premium while Three Twins does not. @D: Is it really fair to knock them for not being super premium when they never claim to be super premium? If you prefer denser ice cream, that's fine, but that's not my personal base frame of reference. I ate regular/mainstream ice cream as a kid and that's my base point of reference on how I look out on to the world. I didnt try B&J until college. I can't pick on them for non being heavier as that isn't a selling point for them, simple and organic is. 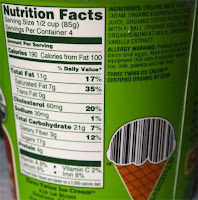 Their pints always have plenty of flavor in a formula that doesn't leave a coating of chemicals on your tongue. That's a win in my book. As far as icy goes, that's probably a mix of store handling and the fact that without a compliment of stabilizers and gums in their ice cream, there is less food science to prevent the ice from happening. That's absolutely true. Its not advertised as such and thats a totally fair point. I guess I look at the price point and make comparisons. But it is organic so you have to factor that in. And they offer a lot more flavors than any other organic brand by far and more creative flavors too. I did a weekend when I tried lemon cookie, dads cardamum, and madagascar vanilla all at once which was my first try at Three Twins. They were ok but I didnt go back again for my reasons above. Actually for most people the lower calories would probably be a positive. yeah, if it's late in the day (say after 9pm), I prefer something lighter and simpler. my super premium cravings tend to attack in the 12pm-3pm range. I wonder if your store has the same issues my market basket does. there are definitely less icy pints out there. it can be frustrating weeding through the ones that aren't as fresh. I posted this on the other review but I had a major thin/icy issue with both pints I purchased. I've had this fresh in SF and it was good but the grocery purchases were really disappointing. @Ryan: do you live in California or where you just visiting SF? this icy issue is bugging me more as more people point it out. Was hoping it was more of a fluke. I was visiting SF(might have been while we were in Napa) and had it in a small market type of thing when I had it fresh. I bought the two frozen pints in NJ where I live. I've had many "all-natural" types of ice cream but never experienced what I did with this ice cream. It was bad and consistent enough to make me think this is probably a common problem if it ever thaws and re-freeze in transit. ok, thank you for the info, maybe it's an east coast issue. I've had plenty of non-icy all natural too, but often it's local(ish) or technically there are all natural stabilizers they can use.